I have orders from three clients on 5/3. I want to know if any of them go from 'on time' to 'at risk'. 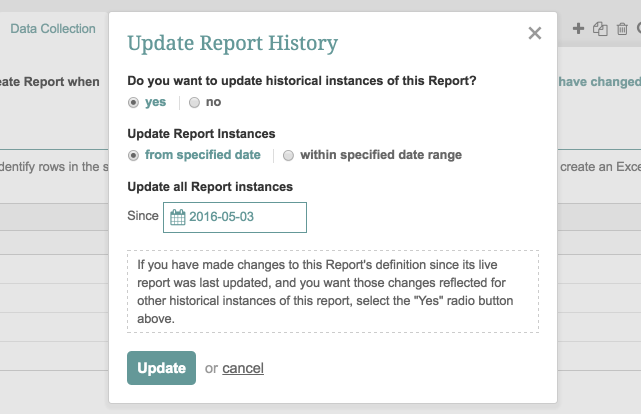 This report 'keeps history' each day (also called a snapshot report). Make sure 'Select rows when ALL of the filters are satisfied. This is the 'AND' condition for the filter. Otherwise it will be an 'OR' statement. I only need to see the Client, Order number, and Status on my Change Report. I choose to only show the current and prior value for the 'status' column since I know the client and order number will be the same on both reports (they are my key fields!). I change the format of the current order number so that the number doesn't have a comma in it (1,234 vs 1234). I want to look for changes from 5/3 forward. 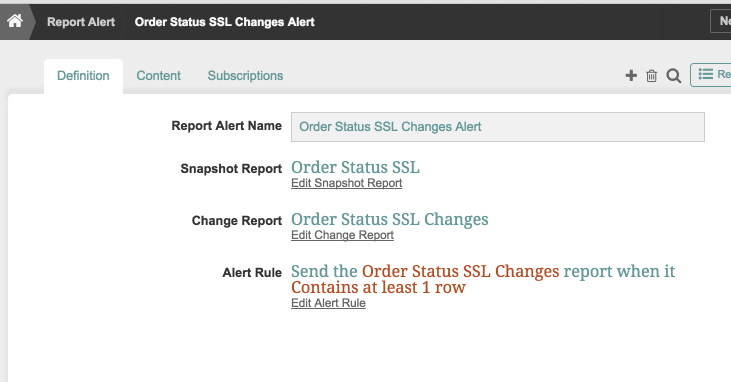 Use the 'edit snapshot report' to go to the underlying report and the 'edit change report' to view/modify settings on this change report. You can also click this link and then click the 'View' button to see the report (otherwise you will get it via email on the next change).